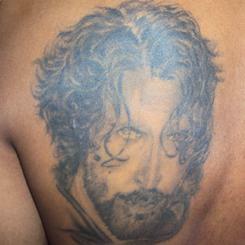 A Hrithik Roshan fan wanted to prove his love for his idol by making something permanent — so he flew into Mumbai from Delhi just to have the actor’s face tattooed on his back.This impromptu trip by Sachin Bhatnagar, who works in a private firm, was a complete surprise to his unsuspecting wife Rekha. Bhatnagar got the tattoo done in the afternoon and then flew back to Delhi the same night. “Initially, he wasn’t taking off his shirt in front of his wife for a few days,” a source revealed. “But how long could he hide it? When she finally saw the tattoo, his back was swollen and red. Hrithik’s picture staring in front of her eyes added to her shock. Now she is okay,” the source added. “I wanted to be a part of the dance show Hrithik is judging (Just Dance). I went to Mumbai for that too, but nothing happened. Frankly, I was expelled in the preliminary audition stage itself,” he added. More to come after Onam!